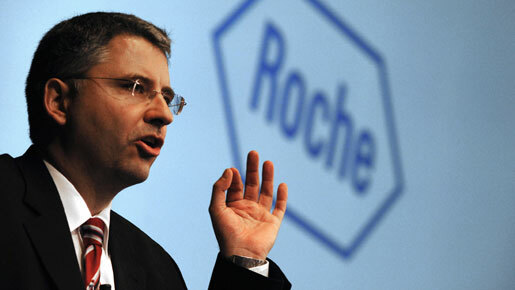 Roche has revealed record sales in the teeth of a recession. Its 42-year-old CEO has masterminded its $47m takeover of Genentech. Schwan is investing in science, not short-term sales. Will it work? For a company just emerging from recession, achieving record sales double digit growth is something to squawk about. Operating profit for 114-year-old Roche has soared 14 percent and pharma product sales have accelerated 15 percent. “In a turbulent external environment Roche performed extraordinarily well,” Roche boss Severin Schwan said recently in a company statement. Schwan, just 42, is doing okay. More than okay. He’s been in the top job little more than two years, but in that time he’s overseen a huge acquisition (Genentech) as well as pile on the performance in a very serious recession. The Genentech deal was, in reality, a baptism of fire. Lending fell off a cliff. Yet Roche managed to raise the cash and seal a deal. Roche has also been helped by strong sales of antiviral Tamiflu thanks to the rapid spread of swine flu. Schwan also created a raft of changes – inevitably upsetting a few traditionalists – by revamping his management team. So what kind of a company does Severin lead? Pharma? Biotech? Healthcare? In reality it’s a mixture of all of those, to varying degrees. However increasingly closer ties with the specialist Biotechnology Industry Organisation Trade group tells you where Schwan’s ultimate loyalties lie. Diagnostics is a big part of Roche now (Schwan was previously head of Diagnostics for Roche in his last role). Products are about supporting lab and hospital services as well as taking a big role in genetic knowledge and research. This is twinned to Roche’s deep experience with pharma – so a pretty good marriage. While competitors like Glico and Pfizer are focusing on bespoke-type R&D operations, Roche’s approach appears more haphazard; Schwan is not going to get too worried if some of his Roche Group operations overlap; in fact, that could be a good thing, encouraging contrast-and-compare opportunities between their own departments. Schwan has also chosen to leave the innovative unit more or less to its own devices, focusing on brain diseases, cancer and immunology. Its campus-type culture will also be preserved. There will be no big-business-bearing-down-on-the-little-guy issues here. Genentech should find itself on a very long lead. The ultimate goal in all of this for Schwan? Genuine innovation. That means a big no to generic drugs, vaccine treatments and various over-the-counter products. Cleverly, that niftily removes Roche from the downward destructiveness of price competition, especially when patents fall by the wayside and generics take over. He certainly wants support from insurers. Roche has already got treatments like Herceptin and Avastin – cancer treatments that have been welcomed by the market – which are being covered by insurers. “Just a few years ago the diagnosis of cancer was tantamount to a death sentence,” says Schwan. “Today, thanks to these drugs, we can significantly extend life and tangibly improve patients’ quality of life. At Roche we will continue to put a premium on innovation.” So it’s also about very targeted treatments and medicines. Schwan believes a rejuvenated Roche stands at the cusp of a new age of drug research and treatment. His personal style is highly focused though collegiate; the Swiss corporate culture has a reputation for being consensus driven. But Schwan’s also part of the generation that want a work/life balance – though he wants to make damn sure he enjoys himself on the job too. Meanwhile there is much to learn. Even from within. Their recent Californian acquisition was widely admired for its careful production and sales planning – and Roche has decided to foster much of this approach for itself. A huge compliment. A combination of change and innovation means there’s plenty of potential for waste, bean-counters might well warn. But the rainbow-nation approach appears very much Schwan’s style. “If you continuously tell people what they have to do, there won’t be any innovations. I believe in a decentralised management approach and small headquarters. You have to allow sufficient latitude, especially for creative scientists.” That’s the appliance of science, Schwan-style.